"Because these are some of the oldest rocks from the moon, the water is inferred to have been in the moon when it formed," Zhang said. "That is somewhat difficult to explain with the current popular moon-formation model, in which the moon formed by collecting the hot ejecta as the result of a super-giant impact of a martian-size body with the proto-Earth. "Under that model, the hot ejecta should have been degassed almost completely, eliminating all water," Zhang said. A paper titled "Water in lunar anorthosites and evidence for a wet early moon" was published online Feb. 17 in the journal Nature Geoscience. The first author is Hejiu Hui, postdoctoral research associate of civil and environmental engineering and earth sciences at the University of Notre Dame. Hui received his doctorate at U-M under Zhang, a professor in the Department of Earth and Environmental Sciences and one of three co-authors of the Nature Geoscience paper. 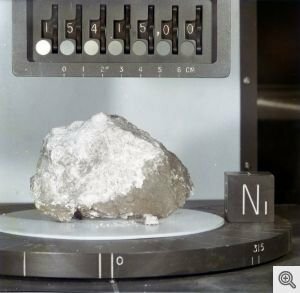 In 2008, laboratory measurement of Apollo lunar samples by ion microprobe detected indigenous hydrogen, inferred to be the water-related chemical species hydroxyl, in lunar volcanic glasses. In 2009, NASA's Lunar Crater Observation and Sensing satellite, known as LCROSS, slammed into a permanently shadowed lunar crater and ejected a plume of material that was surprisingly rich in water ice. In the latest work, Fourier-transform infrared spectroscopy was used to analyze the water content in grains of plagioclase feldspar from lunar anorthosites, highland rocks composed of more than 90 percent plagioclase. The bright-colored highlands rocks are thought to have formed early in the moon's history when plagioclase crystallized from a magma ocean and floated to the surface. The infrared spectroscopy work, which was conducted at Zhang's U-M lab and co-author Anne H. Peslier's lab, detected about 6 parts per million of water in the lunar anorthosites. "The surprise discovery of this work is that in lunar rocks, even in nominally water-free minerals such as plagioclase feldspar, the water content can be detected," said Zhang, James R. O'Neil Collegiate Professor of Geological Sciences. "It's not 'liquid' water that was measured during these studies but hydroxyl groups distributed within the mineral grain," said Notre Dame's Hui. "We are able to detect those hydroxyl groups in the crystalline structure of the Apollo samples." The hydroxyl groups the team detected are evidence that the lunar interior contained significant water during the moon's early molten state, before the crust solidified, and may have played a key role in the development of lunar basalts. "The presence of water," said Hui, "could imply a more prolonged solidification of the lunar magma ocean than the once-popular anhydrous moon scenario suggests." The researchers analyzed grains from ferroan anorthosites 15415 and 60015, as well as troctolite 76535. Ferroan anorthosite 15415 is one the best known rocks of the Apollo collection and is popularly called the Genesis Rock because the astronauts thought they had a piece of the moon's primordial crust. It was collected on the rim of Apur Crater during the Apollo 15 mission. Co-author Peslier is at Jacobs Technology and NASA's Johnson Space Center. The fourth author of the Nature Geoscience paper, Clive R. Neal, is a professor of civil and environmental engineering and earth sciences at the University of Notre Dame. The work was supported by NASA.